With the simple Serti Technique, just stretch your silk and trace the outline of your design with a Resist. Design your own, or choose one of those provided in class. Paint on the dyes, and watch as they flow, blending and doing all kinds of interesting things naturally. Mix all the colors of the rainbow and add design with special resists if you like. Paint a series of fat quarters to use for piecing , hand quilting, beading, applique, and more. Don't be afraid! Silk is washable and easy to sew. These are classes open to all. I have included all the info I have. Contact the host venue for registration and more details. All classes are appropriate for both beginners and experienced painters unless otherwise noted. 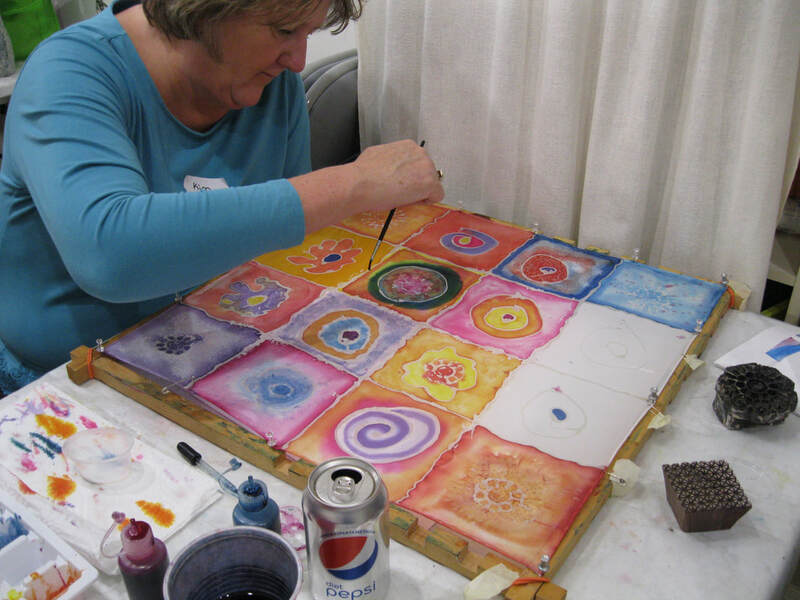 If you know six or more people who would like to paint, contact Janet to set up your own class.